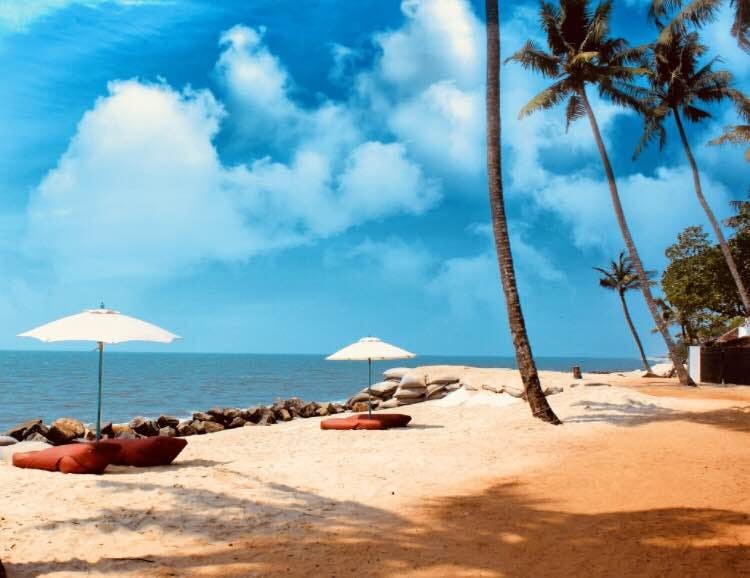 Kerala is like a dream come true for the ones who want to enjoy a vacation peacefully with the oceans. What comes as an icing on the cake is to get yourself to stay in a villa with a private pool, that has amazing food, a hammock to lie on while you can dig your feet in the sand and gaze the night sky in midst of coconut trees. And I happened to stay in a property like that plus in a room that opened door to your own beach. The moment I entered into this property, I did not want to go out exploring the place since the villa was magical. Marari Villas is a unique collection of independent serviced villas on beautiful, undeveloped Marari Beach in tropical Kerala, which is a 20min drive from the famous Alleppey Backwaters, hosted by an amazing couple- Olga and Rupert and their beautiful baby daughter. They have options of five villa to choose from namely Palm, Orchid, Hibiscus, Lotus, and Bougainvillea. They also give you the privilege to have private access to the beach for the number of days you stay with them. You can avail yourself anything and everything with the help of your villa host, from making all your travel arrangements in the town to taking care of your meals and other requirements. I just can’t get over with the hospitality. While I use to sleep or read my books on the beach bed at the coast as those salty waves hit my face, the managers made sure we didn't skip our meals out of mere vacation laziness. The location of the place is a treat to eyes, mind and soul. I could listen to the sound of the waves and chirping birds while taking the Ayurvedic spa. The only thing that I missed was my morning yoga sessions after the tedious working schedules. If you happen to take an early morning walk down the beach, you might get lucky enough to see if you see dolphins diving deep into the oceans at a distance. I saw the fishermen coming back from the daily routine of fishing. The place is capable of capturing you into a zone that’s so peaceful. You don’t need to carry your earphones as the music of nature will mesmerise your senses completely. Everyone who is planning to live in the Marari villas must be considerate since the fishermen and people in the neighbourhood call off the day really early. Make sure you don't make much noise while partying late night as the place is too peaceful.